In this lab, you will implement a simple disk-based file system, and then write exec code to load and run an executable stored in this on-disk file system. The file system itself will be implemented in microkernel fashion, outside the kernel but within its own user-space environment. Other environments access the file system by making IPC requests to this special file system environment. The exec functionality, however, will be implemented in neither the kernel nor the file system, but in typical exokernel fashion, as part of the user space library operating system that is linked into each application that wants to use it. Download the lab 5 code from http://pdos.lcs.mit.edu/6.828/2006/labs/lab5/lab5-handout.tar.gz, and unpack it into your 6.828 directory as before. As usual, you will need to merge our new code for this lab into your source tree or vice versa. The main new component for this lab is the file system server, located in the new fs directory. Scan through all the files in this directory to get a feel for what all is new. Also, there are some new file system-related source files in the user and lib directories, particularly lib/fsipc.c, lib/file.c, lib/spawn.c, and new global header files inc/fs.h and inc/fd.h. Be sure to scan through all of these files. You should run the pingpong, primes, and forktree test cases from lab 4 again after merging in the new lab 5 code. You will need to comment out the ENV_CREATE line that starts fs/fs to avoid Bochs panicking because fs/fs does some I/O. Similarly, temporarily comment out the call to close_all() in lib/exit.c; this function calls subroutines that you will implement later in the lab, and therefore will panic if called. If your lab 4 code doesn't contain any bugs, the test cases should run fine. Don't proceed until they work. If they don't work, use diff -u -r lab4 lab5 to review all the changes, making sure there isn't any code you wrote for lab4 (or before) missing from lab 5. Make sure that lab 4 still works. Then go on to lab 5. This lab is divided into two parts, A and B. We have allocated one week in the schedule for each part. As before, you will need to do all of the regular exercises described in the lab and at least one challenge problem. (You do not need to do one challenge problem per part, just one for the whole lab.) Additionally, you will need to write up brief answers to the questions posed in the lab and a short (e.g., one or two paragraph) description of what you did to solve your chosen challenge problem. If you implement more than one challenge problem, you only need to describe one of them in the write-up, though of course you are welcome to do more. Place the write-up in a file called answers.txt (plain text) or answers.html (HTML format) in the top level of your lab2 directory before handing in your work. The file system you will work with is much simpler than most "real" file systems including that of xv6 UNIX, but it is powerful enough to provide the standard "basic" features: creating, reading, writing, and deleting files organized in a hierarchical directory structure. We are (for the moment anyway) developing only a "single-user" operating system, which provides protection sufficient to catch bugs but not to protect multiple mutually suspicious users from each other. Our file system therefore does not support the UNIX notions of file ownership or permissions. Our file system also currently does not support hard links, symbolic links, time stamps, or special device files like most UNIX file systems do. Most UNIX file systems divide available disk space into two main types of regions: inode regions and data regions. UNIX file systems assign one inode to each file in the file system; a file's inode holds critical meta-data about the file such as its stat attributes and pointers to its data blocks. The data regions are divided into much larger (typically 8KB or more) data blocks, within which the file system stores file data and directory meta-data. Directory entries contain file names and pointers to inodes; a file is said to be hard-linked if multiple directory entries in the file system refer to that file's inode. Since our file system will not support hard links, we do not need this level of indirection and therefore can make a convenient simplification: our file system will not use inodes at all, but instead we will simply store all of a file's (or sub-directory's) meta-data within the (one and only) directory entry describing that file. Both files and directories logically consist of a series of data blocks, which may be scattered throughout the disk much like the pages of an environment's virtual address space can be scattered throughout physical memory. The file system allows user processes to read and write the contents of files directly, but the file system handles all modifications to directories itself as a part of performing actions such as file creation and deletion. Our file system does, however, allow user environments to read directory meta-data directly (e.g., with read and write), which means that user environments can perform directory scanning operations themselves (e.g., to implement the ls program) rather than having to rely on additional special calls to the file system. The disadvantage of this approach to directory scanning, and the reason most modern UNIX variants discourage it, is that it makes application programs dependent on the format of directory meta-data, making it difficult to change the file system's internal layout without changing or at least recompiling application programs as well. Most disks cannot perform reads and writes at byte granularity, but can only perform reads and writes in units of sectors, which today are almost universally 512 bytes each. File systems actually allocate and use disk storage in units of blocks. Be wary of the distinction between the two terms: sector size is a property of the disk hardware, whereas block size is an aspect of the operating system using the disk. A file system's block size must be at least the sector size of the underlying disk, but could be greater. File systems typically reserve certain disk blocks, at "easy-to-find" locations on the disk such as the very start or the very end, to hold meta-data describing properties of the file system as a whole, such as the block size, disk size, any meta-data required to find the root directory, the time the file system was last mounted, the time the file system was last checked for errors, and so on. These special blocks are called superblocks. Our file system will have exactly one superblock, which will always be at block 1 on the disk. Its layout is defined by struct Super in inc/fs.h. Block 0 is typically reserved to hold boot loaders and partition tables, so file systems generally never use the very first disk block. Most "real" file systems maintain multiple superblocks, replicated throughout several widely-spaced regions of the disk, so that if one of them is corrupted or the disk develops a media error in that region, the other superblocks can still be found and used to access the file system. In the same way that the kernel must manage the system's physical memory to ensure that a given physical page is used for only one purpose at a time, a file system must manage the blocks of storage on a disk to ensure that a given disk block is used for only one purpose at a time. In pmap.c you keep the Page structures for all free physical pages on a linked list, page_free_list, to keep track of the free physical pages. In file systems it is more common to keep track of free disk blocks using a bitmap rather than a linked list, because a bitmap is more storage-efficient than a linked list and easier to keep consistent. Searching for a free block in a bitmap can take more CPU time than simply removing the first element of a linked list, but for file systems this isn't a problem because the I/O cost of actually accessing the free block after we find it dominates for performance purposes. To set up a free block bitmap, we reserve a contiguous region of space on the disk large enough to hold one bit for each disk block. For example, since our file system uses 4096-byte blocks, each bitmap block contains 4096*8=32768 bits, or enough bits to describe 32768 disk blocks. In other words, for every 32768 disk blocks the file system uses, we must reserve one disk block for the block bitmap. A given bit in the bitmap is set if the corresponding block is free, and clear if the corresponding block is in use. 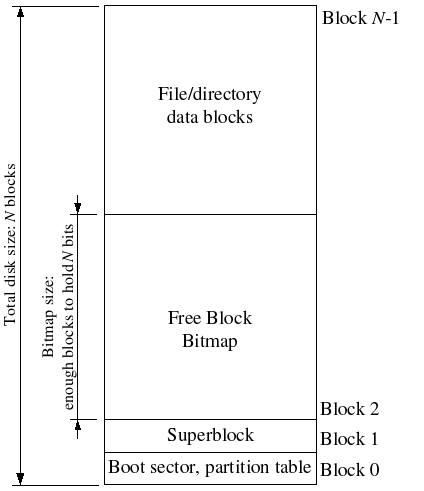 The block bitmap in our file system always starts at disk block 2, immediately after the superblock. For simplicity we will reserve enough bitmap blocks to hold one bit for each block in the entire disk, including the blocks containing the superblock and the bitmap itself. We will simply make sure that the bitmap bits corresponding to these special, "reserved" areas of the disk are always clear (marked in-use). The layout of the meta-data describing a file in our file system is described by struct File in inc/fs.h. This meta-data includes the file's name, size, type (regular file or directory), and pointers to the blocks comprising the file. Unlike in most "real" file systems, for simplicity we will use this one File structure to represent file meta-data as it appears both on disk and in memory. Some of the fields in the structure (currently, only f_dir) are only meaningful while the File structure is in memory; whenever we read a File structure from disk into memory, we clear these fields. The block array in struct File contains space to store the block numbers of the first 10 (NDIRECT) blocks of the file, which we call the file's direct blocks. For small files up to 10*4096 = 40KB in size, this means that the block numbers of all of the file's blocks will fit directly within the File structure itself. For larger files, however, we need a place to hold the rest of the file's block numbers. For any file greater than 40KB in size, therefore, we allocate an additional disk block, called the file's indirect block, to hold up to 4096/4 = 1024 additional block numbers. To keep bookkeeping simple, we leave the first 10 numbers in the indirect block unused. Thus, the 10th block number is the 10th slot in the indirect block (rather than the 0th, as might be done if we were being very space-efficient). Our file system therefore allows files to be up to 1024 blocks, or four megabytes, in size. To support larger files, "real" file systems typically support double- and triple-indirect blocks as well. The superblock in our file system contains a File structure (the root field in struct Super), which holds the meta-data for the file system's root directory. The contents of this directory-file is a sequence of File structures describing the files and directories located within the root directory of the file system. Any subdirectories in the root directory may in turn contain more File structures representing sub-subdirectories, and so on. The file system server in our operating system needs to be able to access the disk, but we have not yet implemented any disk access functionality in our kernel. Instead of taking the conventional "monolithic" operating system strategy of adding an IDE disk driver to the kernel along with the necessary system calls to allow the file system to access it, we will instead implement the IDE disk driver as part of the user-level file system environment. We will still need to modify the kernel slightly, in order to set things up so that the file system environment has the privileges it needs to implement disk access itself. It is easy to implement disk access in user space this way as long as we rely on polling, "programmed I/O" (PIO)-based disk access and do not use disk interruptes. It is possible to implement interrupt-driven device drivers in user mode as well (the L3 and L4 kernels do this, for example), but it is much more difficult since the kernel must field device interrupts and dispatch them to the correct user-mode environment. In the tests that follow, if you fail a test, the obj/fs/fs.img is likely to be left inconsistent. Be sure to remove it before running gmake grade or gmake bochs. Modify your kernel's environment initialization function, env_alloc in env.c, so that it gives environment 1 I/O privilege, but never gives that privilege to any other environment. Use gmake grade to test your code. Do you have to do anything else to ensure that this I/O privilege setting is saved and restored properly when you subsequently switch from one environment to another? Make sure you understand how this environment state is handled. Read through the files in the new fs directory in the source tree. The file fs/ide.c implements our minimal PIO-based disk driver. The file fs/serv.c contains the umain function for the file system server. Challenge! Implement interrupt-driven IDE disk access, with or without DMA. You can decide whether to move the device driver into the kernel, keep it in user space along with the file system, or even (if you really want to get into the microkernel spirit) move it into a separate environment of its own. In our file system, we will implement a very simplistic "buffer cache" with the help of the processor's virtual memory system. Our file system will be limited to handling disks of size 3GB or less. We reserve a large, fixed 3GB region of the file system environment's address space, from 0x10000000 (DISKMAP) up to 0xD0000000 (DISKMAP+DISKMAX), to map a page containing the corresponding disk block when that disk block is in memory. Pages of virtual address space in this region for disk blocks that are not in memory are left unmapped. For example, disk block 0 is mapped at virtual address 0x10000000 whenever it is in memory, disk block 1 is mapped at virtual address 0x10001000, and so on. We can tell whether a block is mapped by consulting the vpt. Since our file system environment has its own virtual address space independent of the virtual address spaces of all other environments in the system, and the only thing the file system needs to do is to implement file access, it is reasonable to reserve most of the file system environment's address space in this way. It would be problematic for a "real" file system implementation on a 32-bit machine to do this of course, since most disks available today are already larger than 3GB. Such a buffer cache management approach may still be reasonable on a machine with a 64-bit address space, such as Intel's Itanic or AMD's Athlon 64 processors. Implement the read_block and write_block functions in fs/fs.c. The read_block function should test to see if the requested block is already in memory, and if not, allocate a page and read in the block using ide_read. Keep in mind that there are multiple disk sectors per block/page, and that read_block needs to return the virtual address at which the requested block was mapped. The write_block function may assume that the indicated block is already in memory, and simply writes it out to disk. We will use the VM hardware to keep track of whether a disk block has been modified since it was last read from or written to disk. To see whether a block needs writing, we can just look to see if the PTE_D "dirty" bit is set in the vpt entry. (The PTE_D bit is set by the processor; see 5.2.4.3 in chapter 5 of the 386 reference manual.) 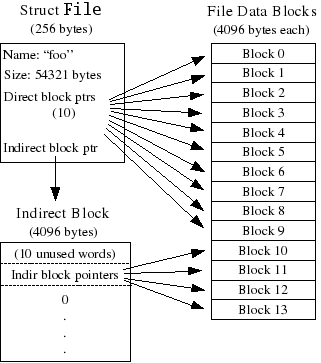 After writing the block, write_block should clear the PTE_D bit using sys_page_map. After fs_init calls read_super (which we have provided) to read and check the file system superblock, fs_init calls read_bitmap to read and perform basic validity checking on the disk's block bitmap. For speed and simplicity, our file system will always keep the entire block bitmap in memory. Implement read_bitmap. It should check that all of the "reserved" blocks in the file system - block 0, block 1 (the superblock), and all the blocks holding the block bitmap itself, are marked in-use. Use the provided block_is_free routine for this purpose. You may simply panic if the file system is invalid. Use block_is_free as a model to implement alloc_block_num, which scans the block bitmap for a free block, marks that block in-use, and returns the block number. When you allocate a block, you should immediately flush the changed bitmap block to disk with write_block, to help file system consistency. We have provided a variety of functions in fs/fs.c to implement the basic facilities you will need to interpret and manage File structures, allocate and/or find a given block of a file, scan and manage the entries of directory-files, and walk the file system from the root to resolve an absolute pathname. Read through all of the code in fs/fs.c carefully and make sure you understand what each function does before proceeding. Fill in the remaining functions in fs/fs.c that implement "top-level" file operations: file_open, file_get_block, file_truncate_blocks, and file_flush. You may notice that there are two operations conspicuously absent from this set of functions implementing "basic" file operations: namely, read and write. This is because our file server will not implement read and write operations directly on behalf of client environments, but instead will use our kernel's IPC-based page remapping functionality to pass mapped pages to file system clients, which these client environments can then read and write directly. The page mappings we pass to clients will be exactly those pages that represent in-memory file blocks in the file system's own buffer cache, fetched via file_get_block. You will see the user-space read and write in part B. Challenge! The file system code uses synchronous writes to keep the file system fairly consistent in the event of a crash. Implement soft updates instead. Now that we have implemented the necessary functionality within the file system server itself, we must make it accessible to other environments that wish to use the file system. There are two pieces of code required to make this happen: client stubs and server stubs. Together, they form a remote procedure call, or RPC, abstraction, where we make IPC-based communication across address spaces appear as if they were ordinary C function calls within client applications. The client stubs, which we have implemented for you and provided in lib/fsipc.c, implement the "client side" of the file system server's IPC protocol. Like fork, these functions are linked into each application that wants to use the file system. When a client application needs to communicate with the file server, it will use the client stubs to perform this communication. Each client stub uses ipc_send to send a message to the server, and then uses ipc_recv to wait for a reply to its request. The server stubs are located in the file server itself, implemented in fs/serv.c. These stubs accept IPC requests from clients, decode and validate the arguments, and serve those requests using the file access functions in fs/fs.c. We have provided a skeleton for this server stub code, but you will need to fill it out. Use the client stubs in lib/fsipc.c to help you figure out the exact protocol between the client and the server. Although we can write applications that directly use the client-side stubs in lib/fsipc.c to communicate with the file system server and perform file operations, this approach would be inconvenient for many applications because the IPC-based file server interface is still somewhat "low-level" and does not provide conventional read/write operations. To read or write a file, the application would first have to reserve a portion of its address space, map the appropriate blocks of the file into that address region by making requests to the file server, read and/or change the appropriate portions of those mapped pages, and finally send a "close" request to the file server to ensure that the changes get written to disk. We will write library routines to perform these tasks on behalf of the application, so that the application can use conventional UNIX-style file access operations such as read, write, and seek. The client-side code that implements these UNIX-style file operations is located in lib/fd.c and lib/file.c. lib/fd.c contains functions to allocate and manage generic Unix-like file descriptors, while lib/file.c specifically implements file descriptors referring to files managed by the file server. We have implemented most of the functions in both of these files for you; the only ones you need to fill in are fd_alloc and fd_lookup in lib/fd.c, and open and close in lib/file.c. The file descriptor layer defines two new virtual address regions within each application environment's address space. The first is the file descriptor table area, starting at address FDTABLE, reserves one 4KB page worth of address space for each of the up to MAXFD (currently 32) file descriptors the application can have open at once. At any given time, a particular file descriptor table page is mapped if and only if the corresponding file descriptor is in use. The second new virtual address region is the file mapping area, starting at virtual address FILEBASE. Like the file descriptor table, the file mapping area is organized as a table indexed by file descriptor, except the "table entries" in the file mapping area consist of 4MB rather than 4KB of address space. In particular, for each of the MAXFD possible file descriptors, we reserve a fixed 4MB region in the file mapping area in which to map the contents of currently open files. Since our file server only supports files of up to 4MB in size, these client-side functions are not imposing any new restrictions by only reserving 4MB of space to map the contents of each open file. Implement fd_alloc and fd_lookup. fd_alloc finds an unused file descriptor number, and returns a pointer to the corresponding file descriptor table entry. Similarly, fd_lookup checks to make sure a given file descriptor number is currently active, and if so returns a pointer to the corresponding file descriptor table entry. Implement open. It must find an unused file descriptor using the fd_alloc() function we have provided, make an IPC request to the file server to open the file, and then map all the file's pages into the appropriate reserved region of the client's address space. Be sure your code fails gracefully if the maximum number of files are already open, or if any of the IPC requests to the file server fail. Implement close. It must first notify the file server of any pages it has modified and then make a request to the file server to close the file. When the file server is asked to close the file, it will write the new data to disk. (Be sure you understand why the file system cannot just rely on the PTE_D bits in its own mappings of the file's pages to determine whether or not those pages were modified.) Finally, the close function should unmap all mapped pages in the reserved file-mapping region for the previously-open file, to help catch bugs in which the application might try to access that region after the file is closed. Challenge! Add support to the file server and the client-side code for files greater than 4MB in size. Challenge! Make the file access operations lazy, so that the pages of a file are only mapped into the client environment's address space when they are touched. Be sure you can still handle error conditions gracefully, such as the file server running out of memory while the application is trying to read a particular file block. Challenge! Change the file system to keep most file metadata in Unix-style inodes rather than in directory entries, and add support for hard links between files. In this exercise you will implement spawn, which creates a new environment, loads a program image from the file system into it, and then starts the child environment running this program. The parent process then continues running independently of the child. The spawn function effectively acts like a fork in UNIX followed by an immediate exec in the child process. We are implementing spawn rather than a UNIX-style exec because spawn is easier to implement from user space in "exokernel fashion", without special help from the kernel. Think about what you would have to do in order to implement exec in user space, and be sure you understand why it is harder. Allocate a stack at USTACKTOP - BY2PG using the provided init_stack function. Load the program text, data, and bss at the appropriate addresses specified in the ELF executable. Don't forget to clear to zero any portions of these program segments that are not loaded from the executable file. Initialize the child's register state using the new sys_set_trapframe system call. Start it running from the entrypoint specified in the executable's ELF header. When you test your code, running the user/icode program from kern/init.c will attempt to spawn /init from the file system. You can add new files to the file system by editing the rules in fs/Makefrag. Challenge! Implement a shared library loading mechanism of some kind, and move the user-level library code (libos.c, fork.c, etc.) into a shared library. spawn("simple", "-f", "foo", "-c", "junk", NULL);  // NOTICE: the trailing NULL! There are two components of this work: what the parent does and what the child does. On the parent side: spawn must setup the new environment's initial stack page so that the arguments are available to the child's umain() function. The parent should format the memory according to the following diagram. | holding NULL | "junk" would be stored here. |     . |  into the "block of strings" above. %esp ->  |   argc       |     and argv reference these two values. If these values are on the stack when umain is called, then umain will be able to access its arguments via the int argc and char *argv parameters. Warning: the diagram shows the memory at USTACKTOP since this is where it will be mapped in the child's address space. However, be careful! When the parent formats the arguments, it must do so at a temporary address, since it can't (well, shouldn't) map over its own stack. Similarly, take care when setting the pointers arg ptr, &argv .. &argv[n]. These pointers need to account for the fact that the data will be remapped into the child at USTACKTOP. We have set up spawn() so that it calls a helper function in the same source file, init_stack(), to set up the new child environment's stack. Most of the code for init_stack() is done for you; it allocates a temporary page and maps it into the parent's address space at a fixed address (from TMPPAGE through TMPPAGETOP-1), then (after the point at which you need to insert code) re-maps that page into the child's address space ending at USTACKTOP. You just need to copy the argument array and argument strings into the stack page at its temprary mapping in the parent, as indicated by the comments in the code. Be sure to change the line that sets *init_esp in order to give the child environment the correct initial stack pointer. The child's initial stack pointer should point to its 'argc' argument, as shown in the figure above. Now for the child side of the spawn: examine the entry path of the child process under the start label. You'll see that it is written such that libmain() and umain() both take arguments (int argc, char *argv). libmain() simply passes its arguments along to umain(). You'll also notice that the entry path also takes care of the case when a new process is created by the kernel, in which case no arguments are passed. The code on the child side has been done for you; you do not need to make any changes. Technical Detail: Actually only the argc and the argv ptr must be placed on the new env's stack. The argv ptr must point to the &argv .. &argv[n] array, each of which point to a string. As a consequence, the &argv .. &argv[n] array and the "block of strings" can be located anywhere in the new env's address space--not necessarily on the stack. In practice, we find it convenient to store all of these values on the stack as has been presented in this exercise. How long approximately did it take you to do this lab? This completes the lab. Enjoy your Thanksgiving Break!